Whether you are inspired by watching home improvement shows or you are in need of professional expertise, doing the best job requires the best tools. Whether you are inspired by watching home improvement shows or you are in need of professional expertise, doing the best job requires the best tools. That’s why you should consider Festool tools, which are proudly offered by Jason Brown Wood Floors. 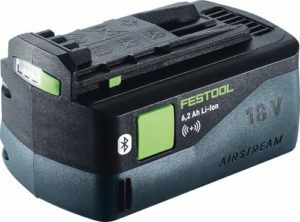 Read on to learn more about Festool’s line of batteries and chargers. Let’s start with a look at the accessories for battery packs. If you have BPC battery packs on hand, then you will want to be sure that you get as many as possible. We offer the Festool Rubber Bumper GR-BPC 15/18. This item works with all BPC 15/18 battery packs. It is also designed for the battery packs belonging to the BPC series in general. If you need replacement battery packs, then you don’t need to worry about it. That’s because these packs provide replacement frames for the PDC 18/4, BHC 18, and DWC 18-4500. Depending on the type of battery packs you need for this category, you have three options. One is the 10.8 V; another is the 15 V Li-ion battery pack; and the third is the 18 V Li-ion battery pack. Choose the voltage that fits what you need it to do. No matter what Li-ion batteries you have, you will need to ensure that they stay charged in between uses. This will cut down on how much effort and frustration you will need to deal with when using the Li-ion battery packs. Whether they are a SCA 8 or TCL 6 model, the rapid chargers should help you get back to work. Lastly, consider the benefits of the NiMh battery packs. The BPS 15,6 S NiCd 2.4 Ah will help you get your project done as well. That’s because it is a replacement battery for the cordless drill that you can use to help put nails or screws in – it just depends on the model of drill you need to use. This battery pack is compatible with T 15+3 and TDK 15, 6. Festool has all of the battery and charging technologies that you might need. Whether you need a new battery for your drill or you’re not sure what accessories you need for it, we can help you out. Sometimes you need the right abrasive tools for the next project you want to tackle. Not to worry, because we offer those products as well! Starting Monday, April 1, 2019 we will have the MW1000 Mobile Workshop and many other new choices available for purchase at our conveniently located Belair, Maryland showroom. Come and see us today! This entry was posted on Friday, March 29th, 2019 at 4:37 pm. Both comments and pings are currently closed.